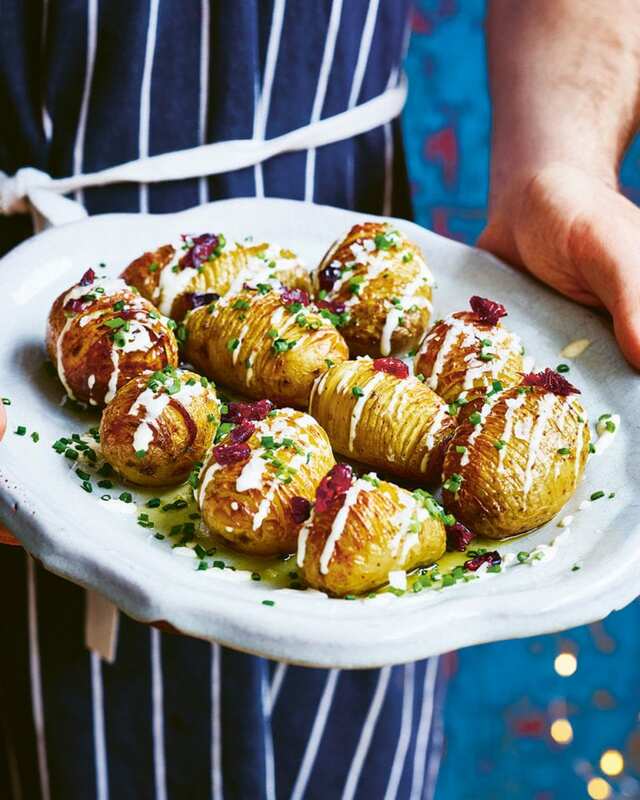 What’s better than crispy hasselback potatoes? Spuds smothered in a silky cheese sauce, that’s what. And this whole dish is vegan too. You can’t go wrong. This recipe is from Gaz Oakley’s cookbook, Vegan Christmas (Quadrille £15). Heat the oven to 200°C/180°C fan/gas 6. Grab a wooden spoon and sit a potato in the bowl of the spoon. Starting at one end, cut across the potato widthways at 3mm intervals. The spoon will stop you cutting right through the potato. Carry on until you’ve sliced all the potatoes, putting them into a roasting tray as you go. Mix the oil, rosemary, salt, pepper, lemon zest and crushed garlic in a small mixing bowl, then use a pastry brush to brush the mixture all over the potatoes, making sure you get down into the cuts. Once all the potatoes are coated, bake for 30-35 minutes or until golden (see tip). While the potatoes are in the oven, whizz together the ‘cheese’ sauce ingredients in a blender or food processor until smooth, then pour into a small saucepan. Heat the sauce over a low heat, stirring constantly, until it’s thick and creamy (see Make Ahead). When the potatoes are cooked, sprinkle over the chives and dried cranberries and serve straightaway with the sauce on the side or drizzled over the top. If your potatoes are large, cook them for up to 15-20 minutes longer. Roast the potatoes and make the cheese sauce up to a day ahead. Cool, cover and chill separately until needed. Reheat the potatoes in a low oven and gently reheat the sauce until piping hot to serve. Nutritional yeast is available from Ocado, health food shops or online at Amazon. It’s made from deactivated yeast and adds a nutty/cheesy savoury flavour, a little like parmesan. Tapioca starch or tapioca flour is made from the root of the cassava plant and used as a thickener. You can buy it in larger supermarkets, health food shops or online at souschef.co.uk. If you can’t find any, use 1 tbsp cornflour instead.